I found myself in Salt Lake City on Friday and really had one option. The state semifinals were being playing at Rice-Eccles Stadium at the University of Utah on the east side of the city. I’ve been to Rice-Eccles Stadium twice before. In 2008, I saw David Beckham score two goals against Real Salt Lake in a draw. And, two months later that year I saw Real Salt Lake beat up my favorite MLS team, the Columbus Crew, 2-0. Which was only reconciled by them winning the MLS Cup that year. But, this time at Rice-Eccles, was for the American kind of football. Now, the UHSAA may have some good teams, and may have some exciting playoff games. But, to an outsider the tournament itself is a bit of a letdown. The UHSAA only has 137 schools. The state then is divided into five classifications (1A through 5A). Sixteen of the thirty 5A schools qualify. Sixteen of the 31 4A schools qualify. And in 3A, sixteen of only 21 schools make the playoffs. Only five sit at home. In Utah, the higher seed hosts the game until the semifinals in 3A, 4A, and 5A. 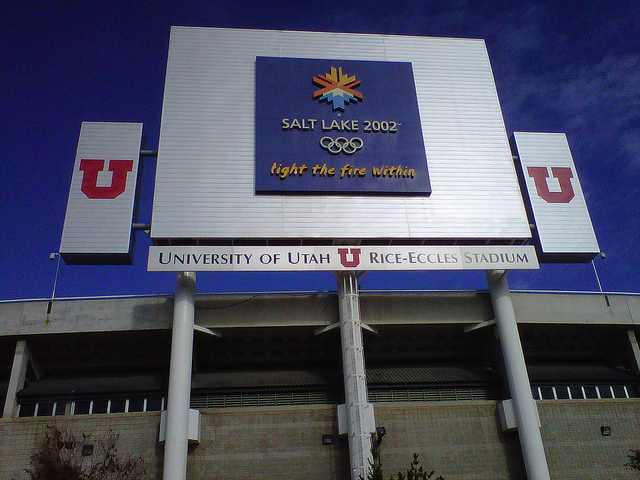 The semifinals and final are all held at Rice-Eccles Stadium in Salt Lake City. 2A (19 schools) and 1A (36 schools) play their title games during the semifinal weekend at Southern Utah University in Cedar City. However, they do have the ability to opt out to a different location. Which, the 2A game was moved to the southern Salt Lake City suburb of Jordan to be played at Jordan High School. As with most western states, geography plays a huge rule in high school sports economics and scheduling. Utah doesn’t use hard cutoffs for teams in each classification. In fact, you could be placed in 2A rather than 1A if you simply have more 2A opponents nearby and are on the bubble. Or, vice versa. Teams can petition to play up or down and then the UHSAA makes their final say. The bulk of the big schools are around the Ogden-SLC-Provo corridor running north-to-south along the foothills of the Wasatch mountains. A great number of the 1A schools are in the southern half of the state in less populated areas. As for scheduling, the largest classification (5A) had to play on Thursday at 11AM and 2:30PM. 3A had one semifinal at 6:30PM on Thursday and on at 6:30PM on Friday. 4A got the early games on Friday, at 11AM and 2:30PM. The 1A and 2A state championships were being played on Saturday in other venues. It was odd seeing the biggest classification get the worst possible playing times. However, looking over the playoff schedule there were a lot of odd playing times. Friday at 3PM, Friday at 5PM. Saturday at 3PM. Friday at 4PM. Very few late night games. Situated at just over 4,000 feet in early November, it does get cold at night, but to realistically expect large crowds for weekday games either before or barely after people finished work is unreasonable. Which found myself in the rather spacious stadium with, I would guess, no more than 5,000 at most for any one game at one time. But, with all that said, there were three good matchups on tap on this day. Taking the TRAX (light rail) to the stadium, I walked through the parking lot to the ticket window and only had to pay $8 for an all day ticket and $1 for the roster/program pamphlet. The stadium, if you aren’t aware, seats about 45,000 and was the site of the opening and closing ceremonies of the 2002 Winter Olympics. Of which there is a lot of symbolism now. From the old olympic flame, to the large facade over the south-facing endzone seats. The stadium sits on the foothills of the Wasatch Mountain Range. The stadium offers the best views from the west side stands as the entire range is seen over the eastern side. From the concourse on the west side, there is great views looking down on Salt Lake city, the state house, the Great Salt Lake, and the mountains to the south of the lake near Magna, West Valley, Bingham, etc. I sat on the Springville side to the east for this one. Partly due to my knowing of the town and also it was in the shade until roughly halftime. The Springville Red Devils wore blue and red uniforms with a trident running lengthwise down their helmet to the front along the center stripe. A rather interesting design. The Highland Rams wore white jerseys with black pants and greyish ram horns a la Colorado State or the St. Louis Rams. Springville came into this game upsetting defending champion Timpview and was the odds on favorite. They had the high powered offense looked to have finally cleared the hurdle after losing the title game last year to Timpview. However, it didn’t turn out that way. Springville led early, 7-3 after a long TD pass. Highland then put together two long drives capped with very long touchdown runs of 63 and 77 yards to go up 17-7. After a Highland field goal, Springville returned the kickoff 88 yards to trail 20-14. A 62 yard run made the score 26-14 and another late touchdown made the halftime score 33-14 in favor of Highland. After halftime, Highland scored to take any drive out of the Red Devils, 39-21. In the early part of the fourth quarter another tack-on touchdown made it 46-21 and that was the final. The public Salt Lake school had the biggest crowd of the day it appeared. Springville traveled the 40 miles or so very well for a Friday morning game. Unfortunately, the drive home would be a long one. After the game, I walked around the stadium and moved to the west side. The temperature was at its highest, peaking at around 46 degrees. sitting in the shade away from the glare of the sun to the south, the temperature began to plummet. As the sun started to fade behind the western stands, the game between the Bountiful Braves and the Mountain Crest Mustangs kicked off. Bountiful wore red jerseys with silver helmets. Very reminiscent of Dover. Mountain Crest wore orange pants and white jerseys with navy blue numbers. Their helmets and overall look was of the SMU Mustangs with orange replacing the red. Bountiful had the biggest vocal fan support of the three games. Their student section easily surpassed the veracity of the Highland supporters. The game was featured on the local Fox Sports Net as their game of the week. This allowed us to see the live feed as well as replays on the video board. Early in the game, Bountiful had jumped out to a 14-7 lead thanks to the shakiness of Mountain Crest. But, that started to change. Mountain Crest’s receiver (which I didn’t get a number) had an amazing one-handed catch holding the ball to his helmet and shoulder pad as he came down to setup the tying touchdown. As I noted, this game had no defense. The offenses had free reign to move the ball with little opposition. After breaking a 28-28 tie with a touchdown, Bountiful returned the ensuing kickoff to tie it up again, 35-35. then, Mountain Crest got to work and drove the field. A great all over the field run on a screen-like toss scored the touchdown to make it 42-35. Bountiful then started another drive, only to finally have a defensive stop. If only by default. Driving into Mountain Crest territory, their QB threw a pass towards the sidelines that bounced off the receivers hands and into the air. An anxious Mustangs player grabbed it and fell down. Jubilation on the Mountain Crest side completely deflated the supporters across the way as they started heading for the exits. The last game featured two private schools battling it out in 3A to face Hurricane from southern Utah. This game proved the antithesis to the high scoring affairs from the early games. Juan Diego and Judge as they were called, had very straight forward philosophies. In fact, it was detrimental. Almost every player on offense who had the ball seemed to try and run headfirst into an opposing player. Very few players carrying the ball seemed to try and avoid tacklers. Instead, it was all head down, find the opponent, and lay into him. Yet, it wasn’t very effective, obviously. Juan Diego is a newer school, whose collective nickname is the Soaring Eagle. They wore two-tone blue, a la the Toronto Argonauts. Dark blue jerseys, pants, and helmets. Light Carolina blue numbers, striping, etc. Judge Memorial was the Bulldogs wearing white road jerseys, gold pants and gold helmets with maroon numbers and striping. Juan Diego opened the scoring on the night, taking a long drive into the red zone. After a stop on third down, they kicked a successful field goal but took it off the board when there was a roughing the kicker penalty that gave them the first down. Shortly thereafter, they score to make it 7-0. And, as the newspaper article makes note, the first 46 minutes of this game were a snoozefest. Back and forth with neither garnering much of anything. Slow. Methodical. Ineffective. It was with their backs to the wall that Judge Memorial started to exert their will on Juan Diego. Starting at the 7 minute mark of the 4th, the anxiety on the Judge Memorial side grew. Forced to punt, the turn around was evident yet lacking. Juan Diego was forced to punt and with two minutes or so left, Judge Memorial made their drive. A beautiful arcing pass to a diving receiver down the sideline set the tone. With less than two minutes to go, an up and out to the slotback avoiding all obstacles and ran it for a 27-yard touchdown. A stressful extra point was good and Juan Diego’s bunkerball approach had to be retooled. Juan Diego came out after the kickoff and were slinging it around and with four seconds left were intercepted on the far sideline to setup a hailmary shot at the endzone. Two deflections later, and the game was going to overtime tied at seven. Juan Diego won the toss and elected to defend. They played to the much more heavily attended south endzone as the windchill was starting to get to me. Judge Memorial opened the play by going three and out and electing to go for the first down. What I can only describe as the most amazing two yard run ever, a quarterback sneak backfired horribly. Their quarterback ran to the line and it went nowhere. Falling backwards from the Juan Diego push, he flipped it to the running back behind him, who started running to the outside. Overcome with two defenders short of the line-to-gain, he flipped it over his right shoulder with his left hand to the next closest Judge Memorial player who snatched it out of the air and took off behind the now tackled player. He lunged and got the first down. Three plays later, they had another decision. This time with a chipshot field goal, they elected for the safe play. Unfortunately, for them, this was anything but. Juan Diego charged the line and easily blocked it and with the recovery ended the Judge Memorial possession. Juan Diego got the ball and got a first down before firing a lob to the back of the endzone to a receiver falling out of bounds dragging his heels backwards. The referee took a moment to verify theh catch, and that a high school kid just made that catch to put his arms up and send Juan Diego’s side into delirium and the Judge Memorial side, who felt the momentum was theirs, into a depressing stupor. I didn’t stay around long, as I headed through the western parking lot down to the TRAX station to get a ride back into downtown. Now, for the game experience. This reminded me an awful lot of seeing the Herbstreit Kickoff at Ohio Stadium. Huge stadium that allowed you to sit anywhere. this was cheap for three playoffs game. Much cheaper than I was expecting as I had already paid $8 in Meridian, Mississippi for one game at a high school stadium. The biggest issue I had was there was no-reentry allowed. Although that issue was minimal as the stadium was on campus nowhere near any restaurants. So, it was stadium food for the entire day. Paying college stadium prices for high school games was a little over the top. And I’m curious exactly how much, if any, the UHSAA made off concessions. I know the $4 hot chocolate venders were raking in a profit in the last game. In 2A, and 1A, the Utah state titles were played on Saturday. In 1A, Duchesne beat Rich, 21-14 in OT at Jordan High School in the southern Salt Lake City suburbs. In 2A, San Juan beat South Summit, 19-6 in what I read was a comedy of errors. Nine fumbles by South Summit. Seven total turnovers combined. And all 19 points by San Juan were off South Summit turnovers. San Juan now has back-to-back championship game victories over South Summit. The schedule for next week in Utah is as follows. All games will be played at Rice-Eccles Stadium in Salt Lake City as a triple header with the same start times as 11AM, 230PM, and 630PM. In other states around the country, starting with teams that I saw play out-of-state who are still alive and kicking going into this weekend. South Carolina (Week 4): Laurens lost to Greenwood in rematch of the previous week. Beaten again, this time, 41-21, to be ousted from the playoffs. Their opponent, Union County, lost 20-7 to Winnsboro Fairfield Central. Texas (Week 5): Memphis finished the season 0-10. Their opponent in that game, White Deer, has advanced to the playoffs and received a bye in the first round. They play Bovina on the 19th. California (Week 9): Jurupa Valley finished the season 1-9 after losing 56-13 to Riverside Patriot. That’s nine straight losses to end the season. Riverside Norte Vista lost to Fontana Summit, 30-0 to close out their regular season at 5-5. I’ll will check next week to see if they are in the playoffs, but I don’t believe so. Mississippi (Week 10): Meridian hosted Ocean Springs and won, 22-0 in the first round of the 6A playoffs. They play Gulfport next week in the quarterfinal round. Missouri (Week 11): Blue Springs won a good game last week against Raymore-Peculiar. This week, much different result. Kansas City Rockhurst beat them in what appears to be an unusual result for them, a 7-0 loss. Now, for some tournament news from around the country. That is a lot of games played at one venue. I understand it’s turf, enclosed, and isn’t monsterously huge. But to hold all semifinal and finals there, as well as several early round games is a bit much. Maybe it’s just me. Or maybe I’m just jealous I don’t live in Cedar Rapids where I could see 21 games in 20 days. I don’t know how I could wind up in Cedar Rapids next weekend, but one or both of those triple-headers is intriguing to watch. Well, that’s it for this week’s write-up. In two weeks I’ll be home for Weeks 14 and 15. I’m seeing the WPIAL Championship Games at Heinz Field on Saturday the 27th and will probably see an OHSAA playoff game on Friday or maybe a PIAA District 10 playoff game if one is on Friday. Then that Sunday I’ll be seeing the Browns-Panthers game with my dad. The following week is the biggie. The six OHSAA title games in Canton and Massillon for the third straight year. I’ve seen 22 games so far this year. Just adding the six OHSAA title games and the 4 WPIAL titles, that’ll be at least 32 on the season. Throw in one or two more, and I’ve easily eclipsed my most high school games in one season by a mile.